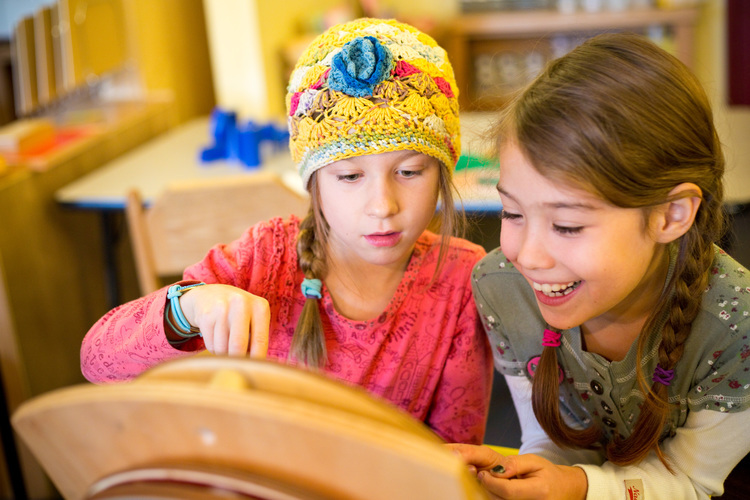 Elementary students study a rigorous curriculum based in science, geography, arithmetic, geometry, language, grammar, and history that follow the outline of Maria Montessori's five Great Lessons. Children pursue their own interests and challenges within this curriculum, developing a love of learning through accomplishing meaningful work. For general questions about the elementary program, contact Jean Peters, Elementary Program Director, at jpeters@greatriverschool.org. School begins at 8:30am and is released at 3:10pm. If students arrive late at school before 8:40am, they will be marked tardy. Arrivals after 8:40am require a late pass from the office. If the office hasn't heard by 9am to expect your student's absence , all listed parents in Powerschool will receive an automated attendance call. To report an absent or late student, call 651-305-2780 or email attendance@greatriverschool.org. Q. Which guide is in which classroom? What are the names of the classrooms? A. We've named our elementary classrooms after rivers and creeks in Minnesota. We currently have 6 lower elementary and 6 upper elementary learning environments. A. Key experiences are a *key* part of the Great River experience! All students, fourth grade and up, go on overnight camping with their peers and teachers. These trips are level-specific and frequently, the students' highlight of the year. All upper elementary students will embark on a four-night trip to Wolf Ridge Environmental Learning Center in Finland, MN. You can check out the Wolf Ridge packing list in the "Quick Links" section at the top of this page. A. Our Parent Engagement Group was made just for that! Your lower elementary classroom ambassadors are Jennifer Gessner (St. Croix), Tia Keobounpheng (Rice Creek), Andrea Ledger (Minnesota), Lesley Mairin (Spring Brook), Liz Lull (Zumbro), and Rachel Damiani (Minnehaha). Your upper elementary classroom ambassadors are Heather Thomas (Little Elk), Jessica Knight (Otter Tail), Cat Rysavy (Swan), Jen Newburg (Shingobee & Crow Wing), Karen Solas (Blue Earth). Ambassadors can be reached at peg@greatriverschool.org. A. Great River uses Powerschool software to track elementary students' attendance. You can click here for a video on gaining Powerschool access. Elementary families will receive mailed progress reports twice a year. A. Yes! We partner with Twin Cities German Immersion School to provide elementary families with bussing. To read more about transportation, click here.